A group of young boys who specializes in burgling houses in Obosi community, Anambra state, have been nabbed by security operatives. The young boys were arrested yesterday. 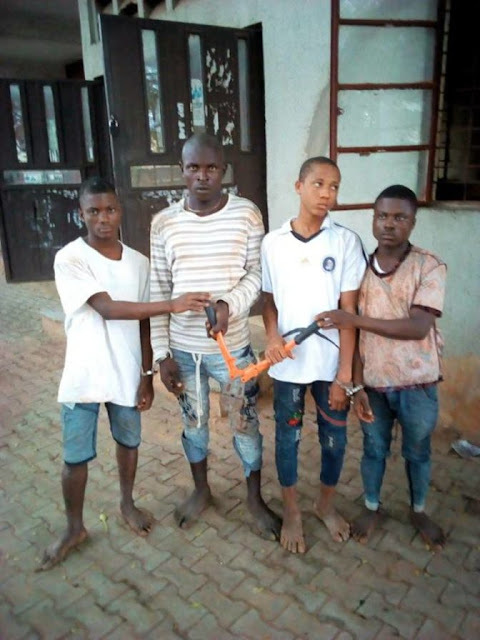 A specialized key cutter was recovered from them. (1) Nwoye Ugochukwu from Utulu Abia State Age 16yrs. (2) Ifeanyi Osuno from Abidi village Umuoji. (3) Chiemelie Osuno from Abidi village Umuoji Age 15yrs. (4) Ifeanyi Simon Onowu from Amafor Village Age Nkpor 24yrs. They have since been handed over to the police for further investigation and possible prosecution.